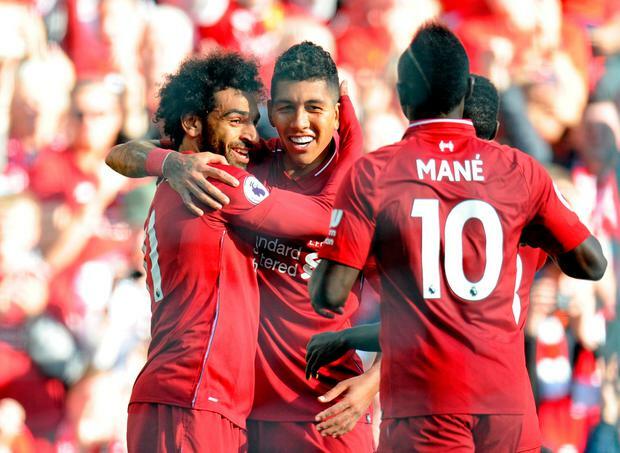 The last occasion was after a 6-1 demolition of Watford but there were no such fireworks this time, although Jurgen Klopp's side capitalised on Manchester City's draw at Wolves to maintain their 100 per cent record with a third successive win. It maintained a 16-month undefeated league run at home, where they have now scored 20 goals without reply - their best run since they hit 20 in a row in 1987-88. Salah's precision strike, his 29th in as many home matches since joining the club, was all it required, curling a low shot inside the far post in the 23rd minute. Everything seemed to be be half a yard short or off target as the quick, sharp transfer of possession which has become a trademark of Klopp's side failed to click into gear. In the first 20 minutes Sadio Mane sidefooted wide from Salah's cut-back, Roberto Firmino had a near-post header well saved low down by Mat Ryan and Trent Alexander-Arnold curled a free-kick onto the crossbar. On a couple of occasions they had lucky escapes as Liverpool's pressing game almost caught them out but it was third time unlucky when James Milner robbed Yves Bissouma of possession 15 yards outside his own area. Immediately the hosts sprang into action with trademark proficiency; Milner passing to Firmino who laid off for Salah's lethal left foot to do the damage. Early in the second half Anthony Knockaert sliced wide wide Brighton's best chance of the game but the visitors were soon fortunate not to concede a penalty. Ryan clattered into Firmino as he came for Bissouma's wild, high clearance but referee Chris Kavanagh ruled it was the Liverpool player who had fouled the goalkeeper. Shane Duffy almost turned Andy Robertson's cross past his own goalkeeper while Alexander-Arnold had chance to wrap up victory five minutes from time but his left-footed shot was deflected wide. The only concerns for Liverpool were largely of their own making, with goalkeeper Alisson Becker twice almost caught in possession has he lived up to his reputation as a 'footballing' goalkeeper. On one occasion early in the first half he came racing out for a through-ball but failed to connect properly in a challenge with Solly March and was fortunate the Brighton player's poor control sent the ball out for a goal kick. The Brazil international produced one save worthy of note and it was a vital one as he parried wide substitute Pascal Gross' header.